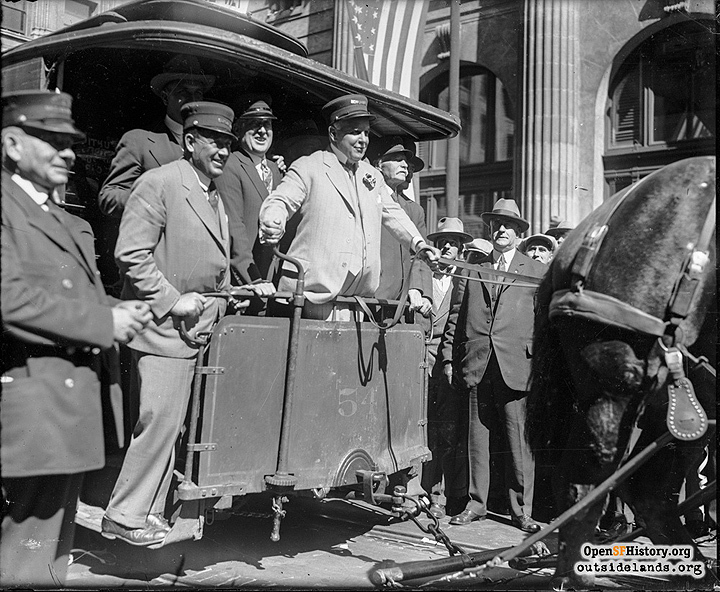 Mayor Rolph on the last day of the Montgomery Street streetcar, 1927. Rolph's first term as mayor included an impressive array of accomplishments—the Panama Pacific International Exposition, construction of the Civic Center, initiation of service on the Municipal Railway, and important steps toward ensuring an adequate water supply. In each case, Rolph closely identified himself with the accomplishment, held up the project as a benefit to the city as a whole, and sought to realize a vision of civic unity based on toleration, a harmony of interests, and symbols of progress achieved through commitment to common goals. Throughout his first term, Rolph brought all his considerable energy to bear on the attainment of unity and progress. He did so in a context considerably different from that of his predecessors and a brief look at this•changed context must precede more detailed treatment of the Rolph years as mayor. Rolph's inauguration coincided with nationwide reforms in the structure and function of government at all levels—local, state, and federal. Taken together, these changes make•up a part of progressivism. San Francisco had already witnessed a number of typically progressive reforms before Rolph became mayor, notably the new charter and the graft prosecution. Several other changes in city government came during Rolph's tenure. In some of those changes, Rolph played the role of initiator or proponent; for others, he was little more than an interested bystander. One set of changes that Rolph did little or nothing to bring about, but which he embraced and came to personify, involved substantial reductions in the power and influence of organized political parties. Changes in the process of balloting, creation of a strong Civil Service Commission, restrictions on the number of patronage positions available for party loyalists, and charter amendments making city offices nonpartisan, all weakened political parties prior to Rolph's election in 1911. State legislation in 1911 and 1913 extended nonpartisan status to other offices, and other state legislation in 1909 and after established and extended the direct primary. (2) As a result, the once-mighty empire of party organization stood in disarray by the midpoint of Rolph's :first term. When Rolph took his oath of office in 1912, he told the supervisors that “our city may little note nor long remember what we say here, but let us so conduct our administration that it can never forget what we will have done here.” In four years he had done much. He seemed a whirlwind of motion energetically promoting first one bond issue, then another, leading a parade, presiding at a groundbreaking, initiating a new streetcar line, laying a cornerstone, greeting visiting dignitaries, dedicating a new building. Constantly in the public eye, he had a phenomenal memory for names and faces. An instinctive democrat, he disliked the pretensions of those who considered themselves to be "the best people" or "right-thinking businessmen." He especially questioned the commitment of the Chamber of Commerce to work for "the benefit of all the people" and did not belong to the organization that had been created in 1911, even though he had held high office in two of the organizations that had been merged into it. He strongly and repeatedly supported the right of workers to unionize and to bargain. (32) Through hard work, careful selection of subordinates, reliance on expertise and planning, and his own outgoing personality, he succeeded in creating—briefly—a high degree of unity based on pride of accomplishment and on himself as symbol of the city. It was an extraordinary feat, given the strife of the decade from 1901 to 1911. But the "Era of Good Feelings" was also short-lived. Rolph ... will order the siren on the Ferry Building blown, or the streets decorated with flags and bunting, on the slightest provocation. Hardly a week goes by without a parade up Market Street with Rolph leading the show. Most of the time it is a motion picture actress up from Hollywood. Hines claimed that “the highest dignitary of the nations of the world might be visiting San Francisco and, if paraded up Market Street, Rolph will take as many bows with his silk hat as the dignitary.” Hollywood, especially, seemed to attract Rolph, and he delighted in associating with motion picture celebrities, especially attractive actresses. According to Hines, Rolph's leading of parades constituted virtually his sole exercise of leadership. These observations coincide with those of Andrew Gallagher, member of the Board of Supervisors throughout much of the 1920s and a personal friend of Rolph. In an interview in 1960, Gallagher recalled that “as the years passed the Mayor gave a decreasing amount of his attention to the problems of administration, and he relied increasingly on his capable secretaries, advisors, and political supporters to attend to the day-by-day problems of government.”(44) As Rolph retreated from the active leadership style of his first term, as he came increasingly to preside (perhaps “reign" would be more appropriate), the politics of the city became increasingly factious. Some projects begun during the period before the war continued almost as if they had a life of their own; other political issues closely reflected the labor-management conflicts of the decade; and in still other political arenas the locus of decision making shifted away from city government to private associations claiming to act in the public interest. With the coming of the rails and the operation of streetcars through the Twin Peaks Tunnel, it will no longer be necessary to move down on the peninsula or across the Bay to Marin or Alameda Counties to find suitable home sites. Enough will be provided west of Twin Peaks. James Rolph left the mayor's office while the freeholders were still in the midst of their work. He had won the Republican nomination for governor in the 1930 primary, defeating the progressive incumbent C. C. Young, and went on to an easy victory in November, winning 86 percent of the vote of his own city and 72 percent statewide. When Rolph first took the oath of office in 1912, he did so in a city without a city hall, a city still rebuilding from the disaster of 1906, a city divided over the proper role of unions and the political power of labor, a city in which the business community was just emerging from disputes over planning and the graft prosecution. Within a short time, Rolph initiated construction of a magnificent city hall and Civic Center, inaugurated the nation's first municipally owned streetcar system, launched the Hetch Hetchy project, and presided over the Panama Pacific International Exposition. While Rolph was very much at the center of all these, as initiator or energetic booster, his drive and enthusiasm failed to survive the Preparedness Day parade bombing, the war, and the labor strife that came in its wake. In the absence of both mayoral leadership and political parties, city voters polarized between business and labor. Rolph found himself unable to accomplish his ideal of amicable labor relations achieved through collective bargaining, and the Industrial Association moved to cripple once-powerful unions. As Rolph behaved more and more like a chairman of the board rather than a corporation president, the movement to create a city manager grew, guided by the Bureau for Governmental Research. The bureau, the Industrial Association, the Panama Pacific International Exposition, and—of course—the Chamber of Commerce strongly expressed the unity and determination of the business community. While the business community never completely dominated city government, the paralysis of city government over key issues of municipal ownership not only produced outcomes acceptable to the business community but often created them. 1. The quotation at the head of the chapter is from Rolph's letter to the Public Ownership Association, Apri1 15, 1913, Rolph Papers, California Historical Society; see also Morley Segal, "James Rolph, Jr., and the Municipal Railway, A Study in Political Leadership;” master's thesis, San Francisco State College, 1959, p. 89; William M. Hines, "Our American Mayors: James Rolph, Jr., of San Francisco;” National Municipal Review 18 (March 1929):163-167, esp. p. 163; see also Moses Rischin, "Sunny Jim Rolph: The First 'Mayor of All the People;" California Historical Quarterly 53 (Summer 1974):165-172; David Wooster Taylor, The Life of James Rolph, Jr. (San Francisco, 1934); and Sabraw, "Mayor James Rolph;” ch. 4. 2. Bruce Allen Hardy, "Civil Service in San Francisco: The Rationalization of Municipal Employment, 1881-1910;” master's thesis, San Francisco State College, 1967, esp. chs. 1, 2; Franklin Hichborn, Story of the Session of the California Legislature of 1909 (San Francisco, 1909), chs. 8-11; Franklin Hichborn, Story of the Session of the California Legislature of 1911 (San Francisco, 1911), chs. 5-7, 10, 27; Franklin Hichborn, Story of the Session of the California Legislature of 1913 (San Francisco, 1913), ch. 28. 3. H. Brett Melendy, "California's Cross-Filing Nightmare: The 1918 Gubernatorial Election;” Pacific Historical Review 33 (1964):324; Duncan Aikman, "California's Sun God;” Nation 132 (Jan. 14, 1931):37; Rischin, "Sunny Jim Rolph;” p. 169; Taylor, Life of James Rolph, pp. 15-20, 44, 68-69, 76-78, 95-96. 4. E. R. Zion, "San Francisco's Bureau of Efficiency;” Chamber of Commerce Journal, Sept. 1912, p. 13; Schiesl, Politics of Efficiency, ch. 6, esp. pp. 111-112;]. Rogers Hollingsworth, "Perspectives on Industrializing Societies;” in Emerging Theoretical Models in Social and Political History, ed. Allen G. Bogue (Beverly Hills, 1973), pp. 109-110. 5. Scott, San Francisco Bay Area, pp. 162-167; Lawrence Kinnaird, History of the Greater San Francisco Bay Region, 3 vols. (New York, 1966), 2:214; Kahn, Imperial San Francisco, chs. 4, 5, 8, and Conclusion; see also ch. 7 above. 32. Segal, "Rolph and the Municipal Railway;” p. 56; Sabraw, "Rolph and the Barbary Coast;” pp. 69-70, 73; marginal comments by Rolph on a letter from F J. Koster, Aug. 23, 1916, Rolph Papers, California Historical Society; Goldbeck, "Political Career of James Rolph;” pp. 7, 51-53; Taylor, Life of James Rolph, pp. 57-58; Chronicle, Jan. 9, 1912, p. 2. 33. Chester Rowell to Theodore Roosevelt, Dec. 1, 1917, quoted in Richard H. Frost, The Mooney Case (Stanford, 1968), p. 233; Todd, Story of the Exposition, 3:80-81, 95-97. 34. Knight, Industrial Relations, pp. 299-307; see also ch. 4, above. 35. Frost, Mooney Case, pp. 63-64, 80-85; Organized Labor (San Francisco), July 22, 1916, quoted in Frost, Mooney Case, p. 81; Gentry, Frame-Up, pp. 79-81. 36. Frost, Mooney Case, pp. l-3, 11-18, 19-25, 39, 72-79, 85-87; Gentry, Frame-Up, pp. 11-23, 33-114,441-477. 37. Frost, Mooney Case, pp. 118-258; Gentry, Frame-Up, pp. 115-227; Zechariah Chafee, Jr., et al., The Mooney-Billings Report Suppressed by the Wickersham Commission (New York, 1932), pp. 242-243. 38. Frost, Mooney Case, pp. 144-150, 153-155, 231; Gentry, Frame-Up, pp. 25-26, 142, 173, 205-215, 224, 233. 39. Frost, Mooney Case, p. 232, 233, 262-267, 273-276; Gentry, 'Frame-Up, pp. 229- 236; Carl A. Silvio, "A Social Analysis of the Special Recall Election of San Francisco District Attorney Charles M. Fickert," 18 December 1917; student paper, Dean's prize competition, San Francisco State University, 1978. 40. Frost, Mooney Case, pp. 295-299, 311-313, 318-319, 483-488; Gentry, Frame-Up, pp. 240-243, 251, 260-262, 422-423, 430-431, 439. 41. Knight, Industrial Relations, pp. 313-322; Steven C. Levi, "The Battle for the Eight-Hour Day in San Francisco;” California History 57 (Winter 1978-1979):349-352; "Rolph Answers Koster;” Labor Clarion, Aug. 31, 1917, pp. 54-55. 42. Assistant secretary to the mayor to A. H. Duke, Jan. 15, 1916, and assistant secretary to the mayor to S. Asano, Jan. 15, 1916, Rolph Papers, California Historical Society; Taylor, Life of James Rolph, pp. 9-10, 20-23, 79-82; Sabraw, "Rolph and the Barbary Coast;” pp. 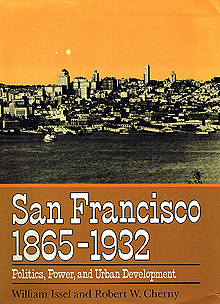 54, 74-75; Roger W. Lotchin, “John Francis Neylan: San Francisco Irish Progressive;” in The San Francisco Irish: 1850-1976, ed. James P. Walsh (San Francisco, 1978), p. 99; H. Brett Melendy and Benjamin F. Gilbert, The Governors of California: Peter H. Burnett to Edmund G. Brown (Georgetown, Ca., 1965), pp. 363-364; John Francis Neylan to William Randolph Hearst, Jan. 18, 1924, Neylan Papers, Bancroft Library. 43. Hines, "Our American Mayors;” p. 164. 44. Andrew Gallagher, quoted in Sabraw, "Rolph and the Barbary Coast;” p. 55. 45. Perles, People's Railway, pp. 63-70,81,91, 96-97; Rolph quoted in McGloin, San Francisco, pp. 179-181. 74. Marylou Almada, "The Appointment of Angelo J. Rossi as Mayor (San Francisco, 1930);” seminar paper, San Francisco State University, 1979.